Since the election things have been rocky for European diplomats. The president's decision to pull the US out of the Paris climate accord has made the situation even harder. Wearing a blue-grey jacket and gold cufflinks, Gerard Araud, the French ambassador to the US, was sitting in an armchair at the Brookings Institution during a panel discussion in early June. He coolly dismissed concerns that a co-panellist, Brookings' Thomas Wright, expressed about "the Trump Crisis in transatlantic relations", as Wright described it. Araud said he wasn't worried. "I trust the American system," he explained, adding that in "the coming months" he hoped to see "a normalisation of the American foreign policy". People in the audience laughed. Many of them saw the president's approach to foreign policy as anything but "normal", at least in the way it was understood at Brookings, and they didn't expect him to change soon (if ever). Still they knew where Araud was coming from - and understood why he was expressing hope about US foreign policy. He's a diplomat, after all. As another panellist, the historian Robert Kagan, said: "If I were ambassador, I would be saying exactly the same thing." That's what diplomats do. When conflicts arise, they try to make things seem OK in public while working behind the scenes to resolve differences. But over the past several weeks the city of Washington, the place where foreign ambassadors live and work, has become a diplomatic minefield. European leaders are trying to show their strength - during a recent meeting in Belgium, for example, French President Emmanuel Macron gave Trump a handshake so firm that his knuckles turned white. 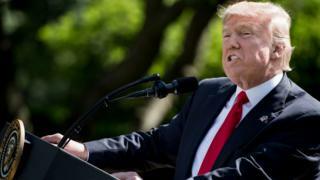 Then Trump announced that the US would withdraw from the Paris agreement - both a climate change accord and a diplomatic achievement. On the day of the announcement, he talked about a "reassertion of America's sovereignty" and said: "I was elected to represent the citizens of Pittsburgh, not Paris." Macron: Birth of the anti-Trump? Will China take over US role in climate? Trump's words were not subtle. Instead they captured the spirit of his "America First" foreign policy. As he explained on that day, he wanted Americans out of the agreement because he thought that it was not good for the country. For some aides at the White House, a "secondary benefit" of the decision to withdraw from the accord, as a senior official told the Washington Post, was that it annoyed the Europeans. Then the president went further. He slammed the London Mayor, Sadiq Khan, with an insulting tweet after a terrorist attack in his city left eight people dead. The conflict between the US president and European leaders at the local and national level has unfolded against the backdrop of a depleted, demoralised US foreign service. At the US embassy in Beijing, the senior most US official, David Rank, resigned as a protest against Trump's decision to pull out of the Paris accord. "I couldn't in good conscience be party to the US withdrawal," Rank said on PBS NewsHour. "We have a disciplined service. You either agree to implement the president's policy or you step aside." Meanwhile, appointments at the State Department have slowed down and dozens of positions are unfilled. Trump administration officials still have not submitted names to the Senate for the ambassadorships to the Belgium, Germany, Austria and other European countries. Besides that, many of the president's senior aides aren't even sure of Trump's views about political and economic issues: his senior aides, for example, seemed to think that he would decide to keep the US in the accord - and then he decided that the US should withdraw. He likes to mull things over, and sometimes he changes his mind at the last minute. For that reason the US officials are not always able to convey the president's ideas during meetings with foreign diplomats. Trump's tweets are mixed, contradictory and often hostile, and his aides don't always know what's going to come next - the sweet-tempered Trump who smiles at European leaders in person, or the wintry one who attacks them on social media. Many Republicans support the president's decision to pull the US out of the accord, and they like the way he keeps his options open in the realm of foreign policy. Matt Mackowiak, a Republican consultant who splits his time between Austin, Texas, and Washington DC, said: "This is a president who likes to preserve flexibility." Many Democrats, though, have been dismayed by the president's approach to foreign policy. "If you box yourself in, that can limit your possibilities," said Mackowiak, adding that he approves of the president's style. "He really doesn't like to be in a situation where his options are limited." "It's a double whammy," says Charles Kupchan, who served as a senior director for European affairs in the Obama White House. "It's both the lack of warm bodies and the confusion that exists within the White House." In the meantime, foreign ambassadors doing the best they can, trying to talk to senior people in the White House, while also struggling to sort out who's important and who's not. On some afternoons, diplomats hang out in cafes and analyse photos of the president and his White House team, trying to determine the power structure of the administration. "There's pictures of the Oval Office, and you're like: 'Who is that?'" said one European diplomat recently in a cafe in Washington DC's upmarket Dupont Circle, overheard while speaking with a colleague. "There's all these people behind him," the diplomat continued. "And you're trying to work out who's important." There's another, darker thread to the story. Some of the diplomats have been deeply troubled by conversations they've had with the people in those photos. Diplomats told me, for example, that a senior administration official quotes neo-fascist French and Italian authors in their interactions. This has left the diplomats speechless. Tom Malinowski, who served as an assistant secretary of state under Obama, says he understood why the diplomats were troubled by what they've heard. "There is a populist and nationalist strain to the Trump administration that has not been present in the White House since - well, probably ever," Malinowski says. "Americans and foreigners alike are trying to figure out what this new ideological strain consists of and where it's headed." Still, he said that some things are clear. "Here's the thing we all know - Donald Trump pulled out of the Paris accord," Malinowski says. "And he's accusing our closest allies in the world of being malicious. "How are you supposed to react to that if you're the French ambassador? You have to make adjustments. And you just batten down the hatches and hope things change sooner rather than later." That's pretty much what Araud did at Brookings. He smiled diplomatically - and left in a hurry.